Can we talk? 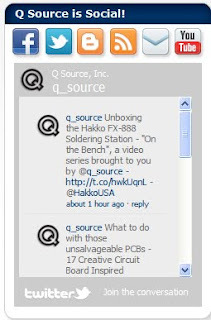 Have you heard about the quick and easy way to access all of Q Source's social media feeds? Just log on to QSource.com and look for the "Q Source is Social!" section of our homepage. There you go! A convenient Social Media Box. Featuring one-click access to our Twitter feed, Facebook page, Q Source Resource Blog, RSS feed, and a link to subscribe to our eNewsletter. Another great resource from Q Source! UPDATE (April 26, 2011): The Q Source Social Media Box now includes a direct link to our YouTube Channel. Give it a click and check out our latest videos—including our new "On the Bench" series. Follow Q Source every day in every way for the best in industry news, product reviews, special offers, and more!